Molecular electronics starts gaining the real world as shown by its use in some of our every-day devices such as the AMOLED displays for smartphones or for the plastic photovoltaics. The challenge lies in the combination of architectures made of organic molecules with the cutting-edge performance of the inorganic assemblies used in nowadays devices. We stand now at a crossing points and the route towards nanoelectronics is open. Within the group devoted to “chemical physics and dynamics at surfaces” in INSP, a researcher with international collaborators have tested how a molecular film of 1.3 nm thickness behaves for driving electrons. They measured the electronic properties of the film and measured how it can transfer electrons towards a gold nanoparticle. Work function is an intrinsic property of a material that control many other fundamental properties. It helps understanding how electrical charges flow through an electrical circuit, how electrons are transferred in catalytic processes, or in electrochemistry. It is crucial to know precisely the value of the work function. For bulk gold, work function is 5.1 eV. How does this figure evolve at the nanoscale ? The researchers at INSP have prepared an organic monolayer 1.3 nm thick, on a crystalline silicon surface, based on a specific molecule called heptanoic acid. This surface is termed GOM for Grafted Organic Monolayer. This GOM monolayer was eventually modified to add the amine moiety which exhibits a strong affinity for gold (Fig 1-a). The morphologic quality and the chemical stability of this surface were thoroughly studied (See INSP highlights 2011, 2013). But important information was still missing, regarding the electronic quality of this surface. The recent data obtained by Pluchery in collaboration with the group of F. Rochet at LCP-MR proved decisive and were published in Physical Chemistry-Chemical Physics in January 2016.By using XPS (X-ray photoelectron spectroscopy) and UPS (ultraviolet photoelectron spectroscopy) they precisely assess the influence of surface defects : a defect as small as one missing electrical charge out of 300 surface atoms, induces a band bending as high as + 0.24 eV. By using UPS, other relevant parameters were measured, such as the work function or the HOMO (Highest Occupied Molecular Orbital) level of the molecules. This study demonstrates that the so-called GOM decreases the work function of the surface down to 3.4 eV (Fig. 1). Finally this study provides a key for interpreting the electric behavior of gold nanoparticles when they are grafted onto this organic monolayer, and explain why their work function is so low. (a) Grafted organic monolayer (GOM) of hetpanoic acid on silicon, modified with an amine group (total thickness 1.3 nm). The scheme below reveals the electronic band structure that was calculated thanks to the XPS and UPS measures. The band bending of the silicon substrate as well as the HOMO and LUMO levels of the GOM are shown. (b) Gold nanoparticles of diameter between 5 and 25 nm have a work function between 5.1 and 5.2 eV when they are isolated. (c) When these nanoparticles are grafted on the GOM via the amine end, electrical charges equilibrate and the nanoparticles are negatively charged. Actually, in 1981, a model was proposed for calculating the work function of an isolated gold nanoparticle. It was shown that it increased of 0.1 eV when the nanoparticle diameter turned smaller than 5 nm. However, this model did not apply when nano-objects are connected to a substrate. The researchers at INSP have undertaken measures of such connected nanoparticles, with KPFM (Kelvin Probe Force Microscope) within a collaboration with M. Salmeron from the University of California Berkeley and with the recently installed AFM-KPFM at INSP. KPFM is able to measure the local work function, with a lateral resolution of 5 nm. Measures have shown that the apparent work function of a gold nanoparticle of 10 nm diameter is lowered down to 3.6 eV when it interacts with our surface, which is a value 1.5 eV lower than bulk gold (Fig. 2). How is it possible ? (a) 3D image of the topography of the GOM surface and of the Contact Potential Difference (CPD, color scale). For some nanoparticles, they are colored in red, which results from the negative charges they have received. (b) profiles showing the height of the particles in parallel with the variation of their CPD. (c) Summary of the measures where the charges of the particles are compared to our theoretical model. Calculations of 1981 were completed and we have shown that a 10 nm gold nanoparticle, accommodates 5 supplemental electrons, because electrons flow from the surface to the particle in order to compensate for the difference in work functions. These 5 electrons, compared to the 10,000 atoms that make a nanoparticles, are just a tiny amount of charges, but with a strong effect. Moreover this supplemental number of electrons depends on the nanoparticle diameter. These results will certainly help better understanding the unexpected properties of small nanoparticles when they are deposited on a substrate, or vice-versa, they can also be used as nanoprobes to study local changes in the electric equilibrium of a surface. 1. 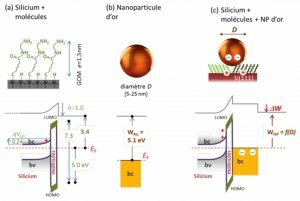 Zhang, Y. ; Pluchery, O. ; Caillard, L. ; Lamic-Humblot, A.-F. ; Casale, S. ; Chabal, Y. J. ; Salmeron, M., Sensing the Charge State of Single Gold Nanoparticles via Work Function Measurements. Nano Letters 2015, 15, (1), 51-55. 2. Pluchery, O. ; Caillard, L. ; Benbalagh, R. ; Gallet, J.-J. ; Bournel, F. ; Zhang, Y. ; Lamic-Humblot, A. F. ; Salmeron, M. ; Chabal, Y. J. ; Rochet, F., Static and Dynamic Electronic Characterization of Organic Monolayers Grafted on a Silicon Surface. Phys. Chem. Chem. Phys. 2016, 18, 3675 - 3684.